The world would be a much safer place without nuclear weapons but nuclear-armed states’ belief in the efficacy of “deterrence” continues to stymie progress at the UN. 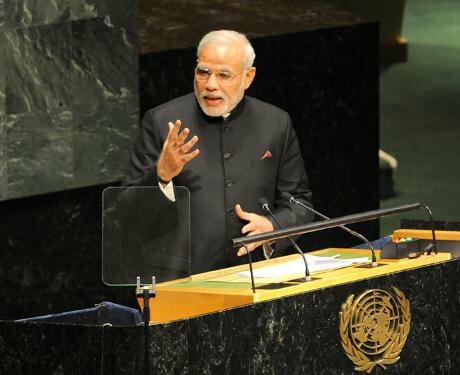 Speak softly and carry a big stick: Narendra Modi's speech to the General Assembly urging redoubled efforts for global disarmament—this photo is from his Flickr account—did not refer to the nuclear arms understood to underpin India's conflict with Pakistan. States are gathered at the United Nations in New York for the 69th session of the First Committee of the UN General Assembly, to discuss various international-security matters. But among the issues under debate in the four weeks to 5 November, implementing nuclear disarmament remains the most contentious. While divergence on how to achieve progress is not new, a simmering, fractious discontent is reaching boiling point. Strongly worded statements to the general debate in the first week of the meeting—in this forum where words matter—revealed the growing frustration of most of the world’s states with the slow pace of implementing disarmament commitments by states with nuclear arms. These disarmament commitments, in theory legally binding, were enshrined in the “bargain” represented by the 1968 Nuclear Non-Proliferation Treaty (NPT). [ The other side of the bargain was that non-nuclear weapon states would promise never to develop nuclear weapons. Continued ignoring and sidestepping of the disarmament pillar in the NPT’s trinity of pledges—non-proliferation, disarmament and peaceful use of nuclear technology—has increasingly placed the credibility of the non-proliferation regime and the treaty review process under strain. The UN’s high representative for disarmament affairs, Angela Kane, and many non-nuclear-weapons signatories seek a “swerve” towards overdue action on nuclear disarmament, including a reframing of nuclear arms as catastrophic and inhumane weapons which should play no role in defence and security doctrines. But the NPT nuclear-weapons states—the US, UK, France, Russia and China—and some of their allies consider such urgency hasty and “impractical”. Following the election in September of a Social Democratic-led government in Stockholm, after two centre-right terms, the Swedish statement to the First Committee pledged to highlight the humanitarian dimension of nuclear weapons. Whether this marks the return after an eight-year hiatus of a disarmament champion (and former member of the New Agenda Coalition) remains to be seen. But Sweden’s argument that “nuclear weapons should be seen as a relic of a bygone era” marks a welcome shift of tone. Sweden was one of 155 states which supported a statement on the humanitarian consequences of nuclear weapons delivered by New Zealand’s ambassador, Dell Higgie. This referred to “the unacceptable destructive capability and indiscriminate nature” of nuclear weapons and contended that “it is in the very interest of the very survival of humanity that nuclear weapons are never used again, under any circumstances”. As in 2013, Australia delivered an alternative statement, on behalf of 20 states—a notably smaller grouping which included many NATO members, plus Finland, Australia and Japan. Their statement claimed there were “no short cuts” and suggested that “eliminating nuclear weapons is only possible through substantive and constructive engagement with those states which possess nuclear weapons”, recognising the need “to work methodically and with realism … to attain the necessary confidence and transparency”. Arguing in similar vein that “there is no way to skip to the end and forgo the hard work of preparing for the technical and political disarmament challenges that lie ahead”, the US under secretary for arms control and international security, Rose Gottemoeller, said that “the global public must both understand the significant humanitarian impacts of weapons of mass destruction and the achievable way we can reduce and then eliminate them”. Sweden’s argument that “nuclear weapons should be seen as a relic of a bygone era” marks a welcome shift of tone. The Norwegian statement to the general debate however lamented that “multilateralism in nuclear disarmament remains … plagued by a long-lasting impasse” and highlighted the “risks and consequences of continued collective inaction” regarding the 17,000 nuclear weapons still in existence, 25 years after the end of the cold war. Pointing to recent research on risks and the lack of an adequate international capacity to respond in the event of a nuclear detonation, Ireland’s representative urged the “moral and legal imperative to pursue collectively the interlinked goals of the NPT”, including “real and tangible progress towards nuclear disarmament”. And Kane suggested “a different kind of step-by-step approach, one focused on implementing disarmament commitments”, and called for a new “metrics of disarmament” with specific indicators to measure progress. But Russia’s statement stressed that “further advancements towards a nuclear free world” would require the establishment of “appropriate international conditions”, of which “the most essential is ensuring equal security and strategic stability”. Contending that “disarmament does not happen in a vacuum”, Russia criticised the “unilateral development of the global missile defence system” by the Americans and their Prompt Global Strike plans, NATO’s “nuclear sharing” and the perceived US violation of the Intermediate Nuclear Forces Treaty stemming from the standoff over Euro-missiles a generation ago. Many non-nuclear states believe that the fragile relations between Russia and the West which this statement betokened, Ukraine being a case in point, mean that we might never see serious moves towards disarmament—even though nuclear weapons have little or no utility in addressing these, or other, security issues. And the notion that nuclear weapons are essential for the security of the states which hold them has, unsurprisingly, led to other states affirming the value of their nuclear arsenals also. In the past few weeks, amid the media speculation regarding Kim Jong-un’s absence from public view (he has re-emerged), two North Korean ambassadors have made public remarks about the deterrent value Pyongyang ascribes to its nuclear programme. Coming from the only state which has withdrawn from the NPT and violated the de facto moratorium against nuclear testing, this is a worrying demonstration of the continuing currency nuclear weapons are perceived to have. Such entrenched views about nuclear deterrence may ultimately remain the greatest obstacle to achieving nuclear disarmament.